An operation to relieve nerve compression by removing a disc protrusion is called a microdiscectomy. Dr Ball performs microdiscectomy using a specialised keyhole, minimally invasive technique in most cases. This uses a tubular retractor to spread the muscles, rather than cut them – to aid smaller incisions, less muscle damage and quicker recovery. An illustration (A) and intra-operative photo (B) of a tubular retractor for minimally invasive keyhole microdiscectomy surgery. The small incisions (C) are closed with a dissoving stich under the skin and covered with superglue as a dressing (B). Using X-ray guidance, a guide probe is directed towards the area where the nerve is compressed. The tissues in this area are gradually spread (rather than cut) to provide access to the spine. A small amount of bone and ligament is removed to get access to the nerves of the spine. 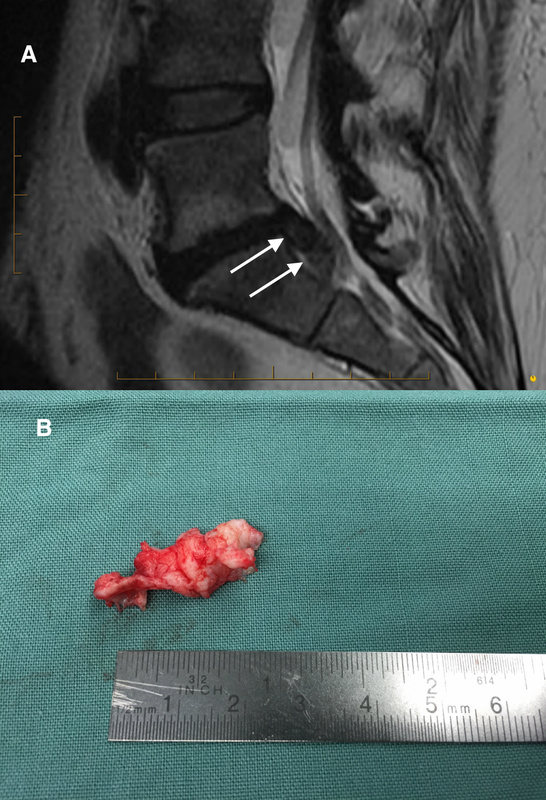 An MRI of the lumbar spine (A) demonstrating a disc protrusion (white arrows) and the fragment (B) removed with keyhole discectomy surgery. The disc material causing nerve compression is removed. Any other loose fragments are also removed. This is done under the operating microscope which allows clear visualisation of the surgery. At the end of the operation, local anaesthetic is injected to provide additional pain relief. The wound is closed with a dissolving suture under the skin. The general anaesthetic is stopped and you will be taken to the recovery room. With the use of modern techniques, many patients are able to go home the same day. Some patients may need to stay between 1 to 2 days depending on the nature of the surgery and personal circumstances. Before discharge, you will need to be able to walk short distances and perform basic self-care.